If you happened by the Lake House outdoor swimming pool in the morning recently, you would have seen groups of first graders with bathing suits and life jackets there. They are children from Frierson and Mt. Zion elementary schools. 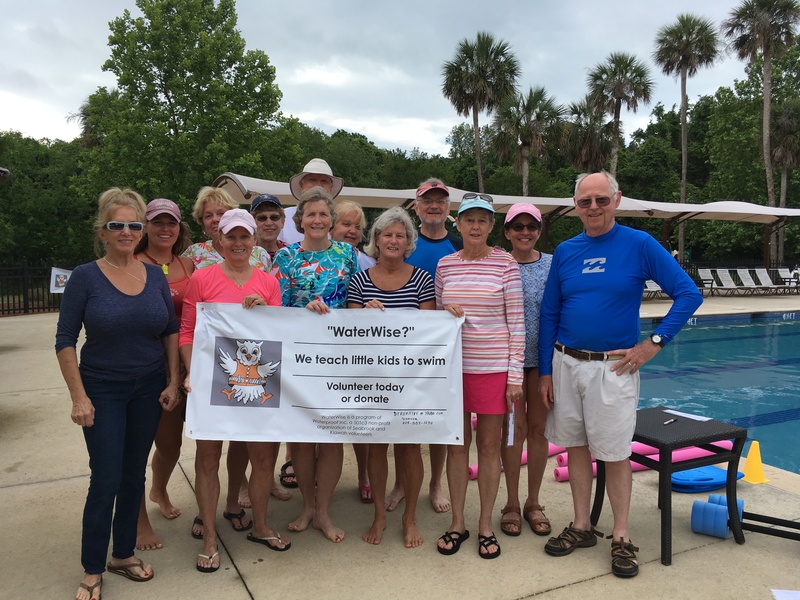 These schools are on Johns and Wadmalaw Islands and these young children are beginning to learn to swim thanks to a dedicated group of volunteers from our island and Kiawah. A program like this is critical to young children who live near water (which is plentiful on our islands) and don’t know how to swim. Many are very afraid of the water and have no skills to handle being in it. Most of the children have never been in a swimming pool before they start the classes. This is not a new program, but under the direction this year of Seabrooker Derek Fyfe, has become even more professional. It has been held, very successfully, at the Boy Scout Camp on Wadmalaw in past years but this year the pool was much too cold to hold a class in May. Derek got permission for these 6-year-olds to use the Lake House outdoor pool to learn to swim, or at least be comfortable in the water. The last two weeks of May at 9:15 am is not a time that many island residents are interested in the outdoor pool so the timing was just right. It is a Monday-Friday program. School staff comes with them and the children are divided into groups of 10 so that they can have carefully supervised time with the volunteers. The staff from the participating schools take the children to play on the basketball court or on the playground when it is not their turn in the pool. They also use the time to take nature walks around the lake. A few “lucky” children saw their first alligator. This program is co-sponsored by the Boy Scouts and the insurance for the Seabrook WaterWise group is purchased through the Boy Scouts. The cost to run this program is about $5000.00 for the two-week session and some of the funds comes from the Kiawah- Seabrook Exchange Club and the rest from fundraising. The goal of the program is to teach water safety and how to swim. It starts slowly with children standing on the pool deck and putting their face in a pan of water that is at each child’s position on the pool deck. After they do that, they are encouraged to touch their nose on the bottom of the pan and then they get to pour the water over their head. Children are told that it is OK to be afraid and this will help them with that fear. All children are in life jackets. They learn to kick on land and then once in the water practice holding onto the side and kicking from that position. Everything is carefully done by the well-trained volunteers and each child proceeds at different speeds. 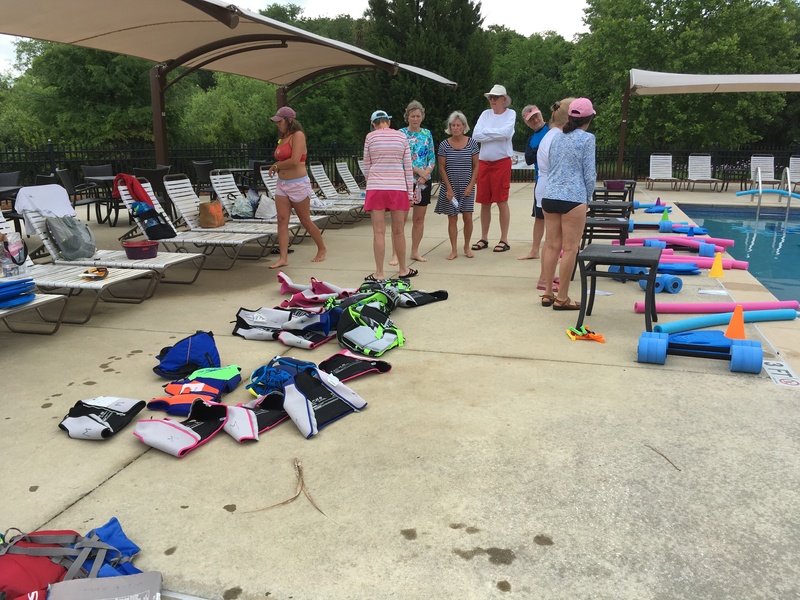 The volunteers must be certified by taking online classes from Swim Lesson University and also training through the Boy Scout online Complete Youth Protection Program. Some coaches are AED/CPR-trained and the group is going to be presented with an AED from the Connor Care Foundation, an organization begun by parents of a child who drowned in a pool. A paid lifeguard is on duty throughout the class, but the rest of the group are volunteers. From Seabrook are Derek Fyfe, Inger Fyfe, Karen Gibler, Lucy Hoover, Kathy Kunkleman, Pam Madaio, Page Maxwell, Jeff Pompe, and Mary Thompson; and representing Kiawah are Susan Francis, Terri Pauls and Karen Lombardi. The program stresses that being able to swim or not, no child is safe in the water without adult supervision. The children are told that swimming in the ocean is different than a pool, so they need to be very careful going into the ocean. The goal of the program, however, is to provide Sea Islands children with the skills to feel confident in the water and to be able to swim. About 30% of the children achieve this goal over the course of the program which is given to the same children in September and May of their first grade year. The volunteers should be commended for helping our Sea Islands children learn these important life skills. Learning to be safe in the water may someday save the life of one of these children. This entry was posted in Health and Wellness, Volunteer. Bookmark the permalink. We will never know how many lives have been saved by this fine group of people but I can give you an accurate count of how many children have gained the all important first steps of a life long love of swimming. We are truly indebted to all involved in this project.